The environment and space held for a Creativitea session is most important to me. My intention is to have us move effortlessly from social to sacred space for the different parts of the process. Circle time brings us into connection with one another naturally, we begin from this place and weave together a container of nurturance for the duration of the workshop. In the middle there may be quiet, chaos, laughter, tears, mess, colour, tea and conversation whilst the making and collage happens. Then embellishment ties it all together and we gather once more in circle to complete. are you starving for some creative, juicy, inspiration? do you delight to sit in women's circle and feel encouraged and uplifted? would you enjoy making your own tea ceremony? would you enjoy a playful morning/afternoon connecting with your inner wisdom? 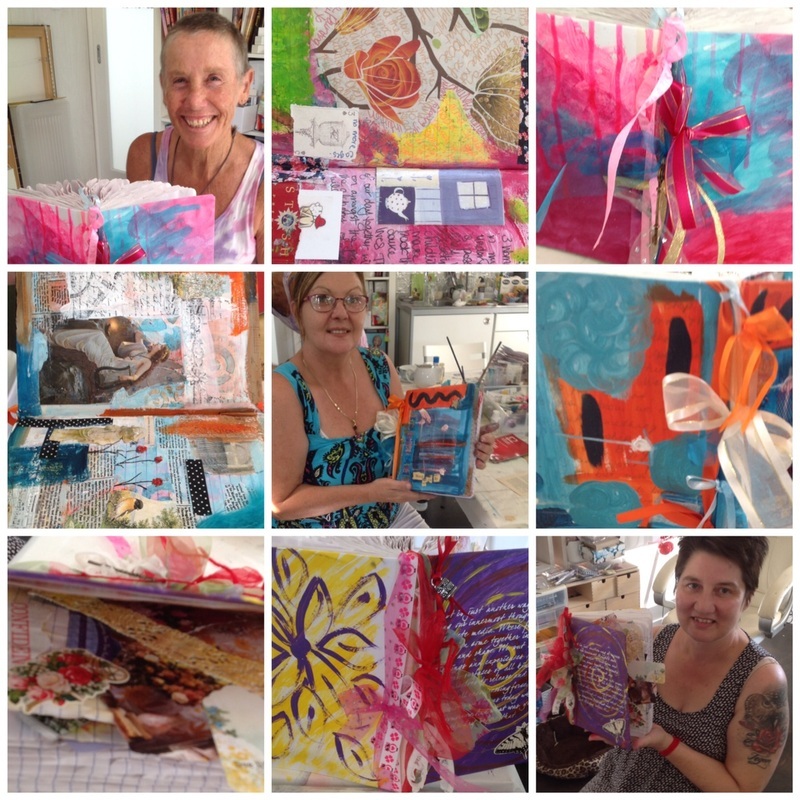 do you need a very special time for your creative spirit to be nurtured? time : 3 - 4 hours. bring your own light lunch if over lunch time. tea and treats are included. You'll be creating an alchemical container. 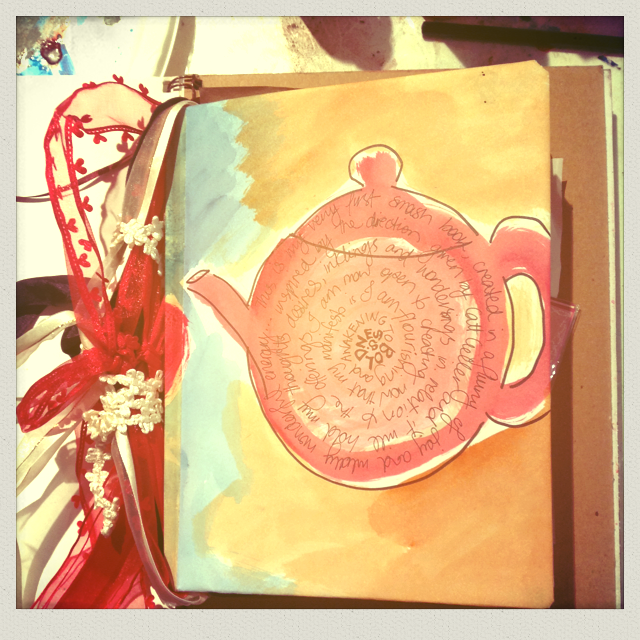 Two of life's delights are tea and smashbooking ... this is a very inclusive and relaxed form of art journaling, the intention is that you actually create an 'alchemical container' - the way we invite the wise self to inform the process for each step, brings a certain kind of awareness and mystical quality. You infuse the book with your energy and from that moment it waits to hold your additions to it, in whatever way they want to show up. Collage, writing, ranting, venting, painting, celebrating, wishing, wondering, creating, seeking . . . any and all have a space to be. 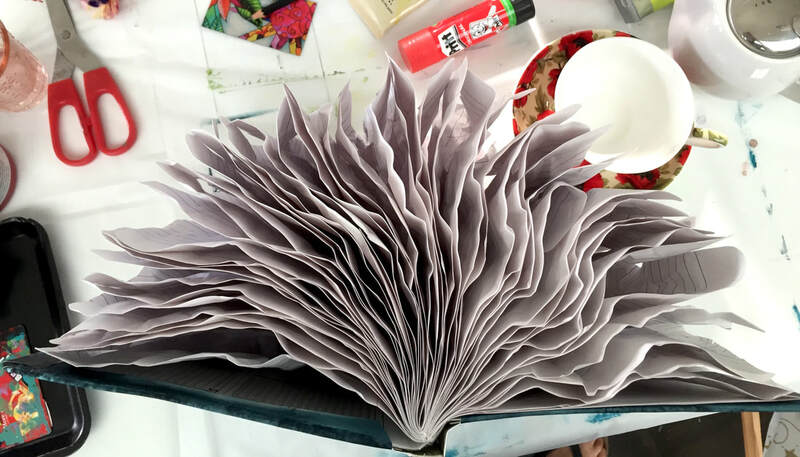 ​From a workshop you will take home a bespoke 'smashed book' of your own design filled with your essence, ready to be your companion, container and space holder. VIDEO : Sharing what I mean by Smashbooking, and a few examples. Your opportunity to gather a group of friends for a unique tea circle. What a special afternoon we had with Denise! Intimate, warm safe and friendly are words which come to mind when I ponder the smashbooking experience. So lovely to sit present with like minded women and share our stories. Denise has the unique ability to create a nurturing space and enable others to get in touch with their inner artist. It was truly wonderful to give my inner artist permission to freely play. The experience has highlighted the need to do this regularly. THANK YOU Denise! This was a wonderful experience for me. My artist could play and run wild with other fun-loving playmates in a beautiful, safe and non-judgemental environment. I am now inspired to add my dreams to my own smash book in the same spirit. Really looking forward to discovering the goddess within and to seeing the beauty that she creates. Thank you beautiful, darling Denise. It was a great privilege to meet you and enjoy that space with you. Also, please thank your man for me for that wonderful beetroot chocolate cake! to hold whatever calls to be put into it and on the day you'll know. We will be creating a hard covered smash book for whatever your heart desires. 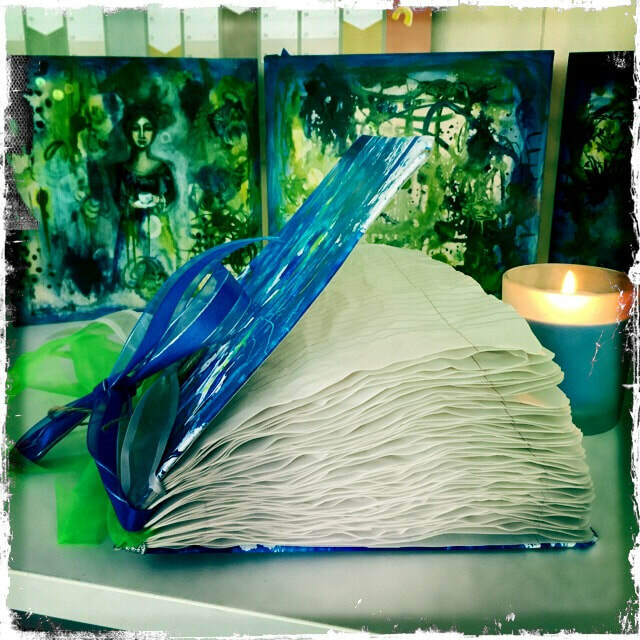 You don't need to know ahead of time because this process has a beautiful way of unfoldment and self nurturing that will inform you exactly what it wants you to make your book about on the day. It may be for your life purpose, your career, your love, a travelling altar... there are limitless possibilities. It's an opportunity, a celebration, a circle of connectedness, an honouring of your feelings. 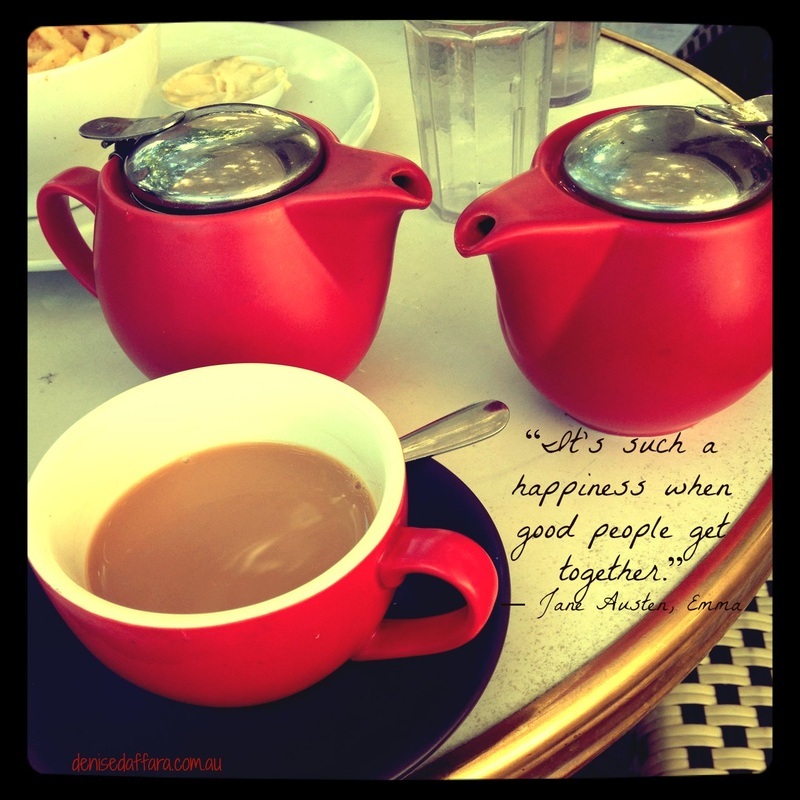 A shared experience of intentional creativitea. 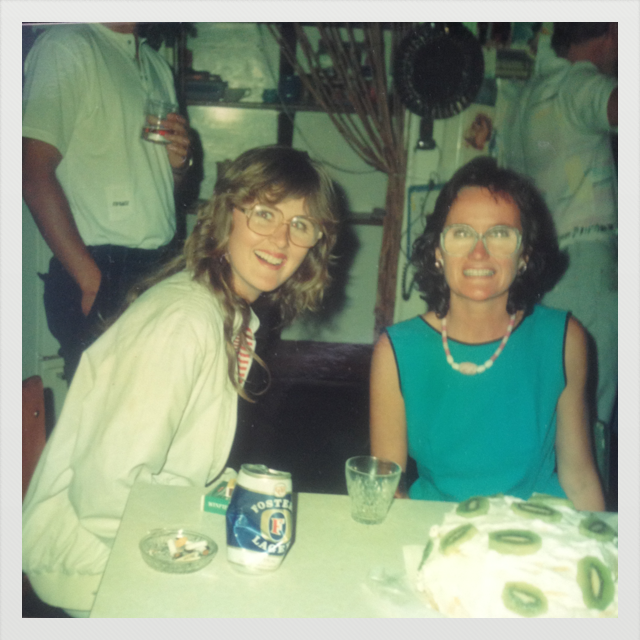 Me at about age 15 with my big sister Min. also available as a private group booking, each person makes a book to honour their loved one. 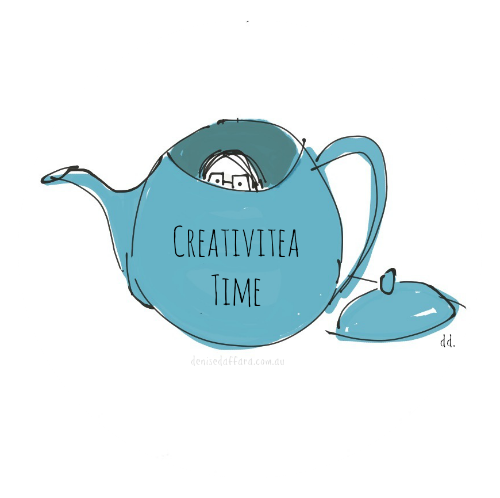 I wish to create an opportunity for those who have lost a loved one and would like to share a time of creativitea and connectedness within a circle of others. We will create a hard covered smash book devoted to hold some of the feelings and memories that would like to be remembered, heard, gathered, celebrated and mourned. My sister Min's life was taken from her in June 1997, I sometimes find letters and pictures around my home and files and it ocurred to me how special it would be to devote a sacred smash book to all that surrounds her time in my life and the impact she had on me growing up, and a place that holds the writings I would like to keep and the hurts that seek to be held. I imagined there would be others out there who might enjoy an opportunity to do this too. * additional items can be ; ribbons of 1metre length at least, string, collage pictures, photo's, ephemera of any kind. proclaimer : I am neither a grief counsellor nor an an art therapist. I have lost a sister to tragic circumstances and experienced deep grief and turmoil as a result, and I have found creativity to be a deeply healing tool for my own journey. I offer support within the containment of a workshop setting to the absolute best of my ability. I encourage participants to seek their own internal guidance using intentional creativity. If you are in a very tender traumatic period, please seek help from appropriate sources, and if you feel up to joining me for this creativitea time you are welcome. Having lost someone near and dear to me many years ago, I was struck with the difficulty many around me had in not knowing what to say, or how to be, so they said nothing. All these many years later I have realised just how much of an important part creativity can have in the healing cycles of life. I’ve made several smash books already.. one holds “my own content for creativitea ideas’, the other is my ‘traveling alter for Beloveds’ and in that I dedicate a page in readiness for workshops or teaching sessions I am having, and clients I work with. So, the idea has been brewing about how deeply moving it may be if people could make a book dedicated to holding space for the one/s they have lost. Sacred Smash Booking is an activity I offer to make a place to hold some of those stories, and rants, and memento’s, things you’d like to say to your loved one now, things you wish you said, wished you didn’t say, I propose a ‘container’ of sorts that is strong enough to hold it all. It may be created in a small workshop setting with friends you’ve yet to meet or I can come to your chosen group and each person can create their own Sacred Smash Book. Join me for one of my workshops to experience this self nurturing gift, or contact me if you'd like to arrange a private group session. Privately commissioned Sacred Smash book . . .
including soulful collages that spoke to the heart of the lady who was to own this treasure..
Where did I learn about smashbooking? In July 2013 I had the absolute pleasure of meeting a lady in California named Catt Geller who taught me how to make a Cosmic Smash Book, as part of my Color of Woman training. Let me tell you, it was the most fun I'd had in a long time, it reminded me of childhood as I used to love wrapping books up and 'selling them in a pretend store'. We took an unsuspecting notebook and transformed it into a living treasure that we infused with our intentions and energy. "The mission of Cosmic Smash Booking is to heal ourselves enough so we may go out and heal others and their children."